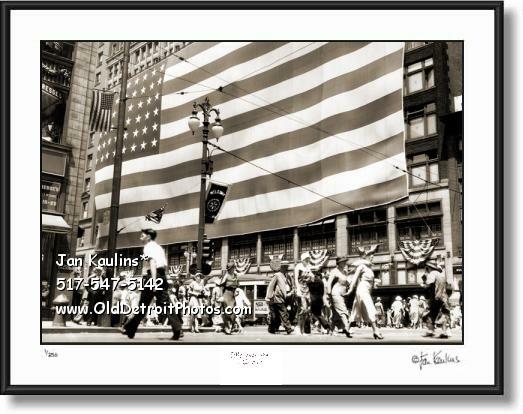 JL HUDSON'S GIANT FLAG on downtown 1934 Detroit J L Hudson's Building photo print picture for sale. This sepia toned black and white Detroit J L Hudson's Department Store photo print is made from the Original restored black and white 1934 rare historical vintage Detroit JL Hudson's photo. At the time this was the World's Largest American Flag and it often graced the side of this landmark JL Hudson's Building on Woodward Avenue in Detroit during Flag Day, 4th of July, and many other significant American Holidays. It is a wonderful iconic image of this long gone downtown Detroit Landmark in 1934. .